I can't believe that last spring was my first time cooking butternut squash! It is so delicious and has become a staple in our diet. We love to cook it on the stove top with garlic, bake it in the oven then mash it up, make soup out of it, and slice it thin and make fries. Yum! 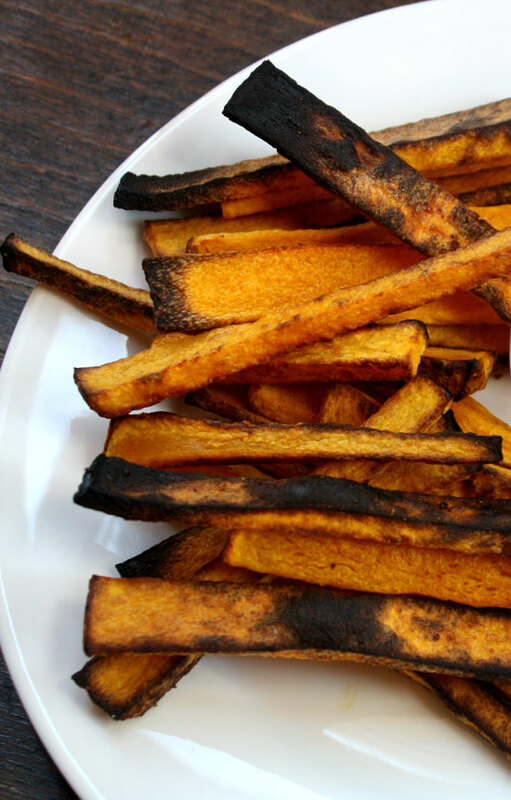 This is our no fail recipe for perfect butternut squash fries, nice and crispy. I like to eat them with salsa, Grant likes to eat them with BBQ sauce and of course you can always use ketchup. Hope you get a chance to try it out this fall! They're delicious and squash is in season, so it's usually pretty cheap! 1. Preheat the oven to 350 degrees, then put your squash in the microwave for 45sec--1min to soften the skin, making it easier to peel. Cut the ends off the squash and peel the skin off. I recommend this peeler. It has saved me so much time! Slice the squash in half and scoop out the seeds. Then slice the rest up to resemble fries/wedges. For perfect technique check out this 48sec. 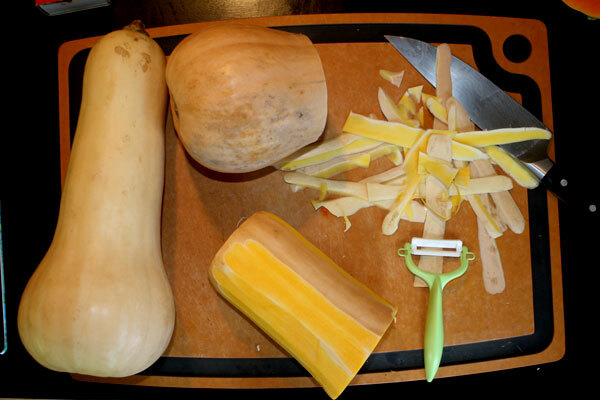 Martha Stewart video on how to cut butternut squash. 2. Toss your fries with olive oil, add salt and lay out on a baking sheet. 3. 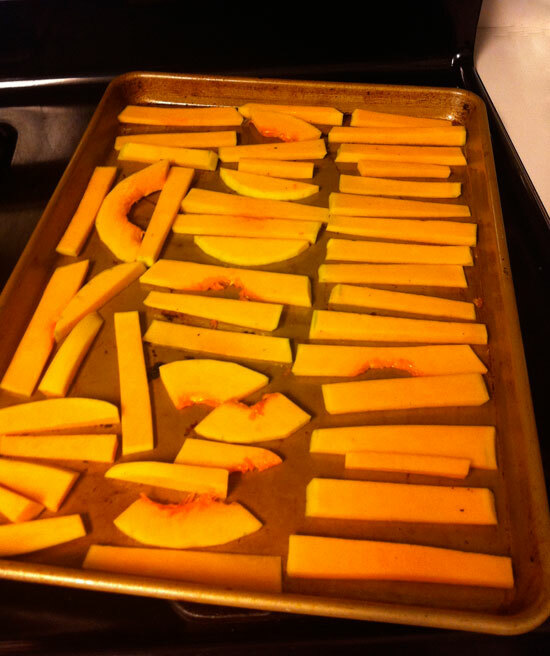 Bake fries for 25-30minutes to cook the squash. Then turn your oven off and put the broiler on HIGH. Broil fries for 5-7minutes watching closely.This makes them nice and crispy! When they're as crispy as you like, pull them out. That's it, you're done! :) I don't bother flipping mine halfway through. Sometimes one side is more done than the other, but it doesn't make a difference at all. They are so good!!! 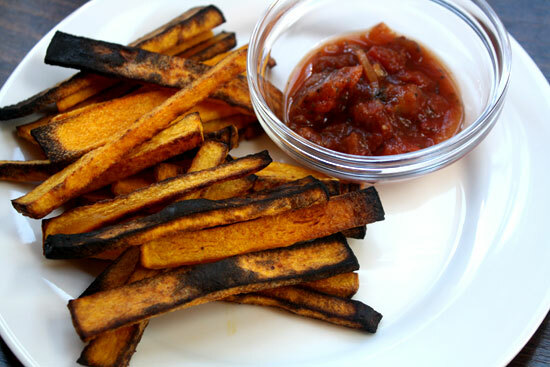 You can also sprinkle garlic salt on your fries or even cinnamon for a little sweetness. P.S. A few more delicious fall recipes: pumpkin doughnuts & frittata pizza!